These EDC knives are portable but also carry a punch with a wider array of sharpness. We are now going to have a look at every man’s pocket knife. These knives are the types of tools that you will find that you will need to use for work or your day to day activities. These Every Day Carry knives are what we need, and we will use for a wide range of activities. These compliment quality and size per inch which in turn add-on to portability. With our guide, we hope that you will be able to purchase a knife that suits your needs. Our guide will help you decipher the code for affordable yet extremely efficient working knives which also come with extravagant looks. Let’s look for the Best EDC Knife for you! In our guide, we will be going through the steps of what to look for, what are the features of a good EDC and what kind of EDC knife is most suitable for your everyday needs. Safety, sharpness, handle grip and blade sharpness are the main key features we will be looking at in detail. Make sure you go through the following information in detail to invest in the right everyday pocket knife. It Must be a lighter Weight but also Rigid: Most of us wouldn’t enjoy carrying around a heavy piece of metal around in our pocket all day. This may seem fine at first, but working hard at our jobs is tough enough, without this extra bit of metal pulling us down. That’s why EDC knives need to be lightweight and compact, but also remembering that these knives must be rigid and sharp, to ensure when we need them so they can get the job done when required. The handle must have a good and stable Grip: It is great that most EDC knives have various locking systems, making sure when we deploy our knives that we are safe. But the most risk while using a knife is when one is performing tasks with our knives. This is where a good grip comes into play. The grip ensures us that we are safe and the blade does not slip out of our hands, causing either injury or a failed attempt and cutting something else. The Blade must stay sharp and not get stained or Rusty: We all know that a blunt blade is a useless blade. So we need to make sure when purchasing our EDC Knives that the blade quality should be of the utmost best. We should avoid purchasing low-quality knives, and handles that tend to get stained or rusted. Even to be sure that the EDC knives folding mechanism does not go faulty on us. This will then, in turn, make it very difficult to use or store away the blade. The blur offers the great grip advantages that all the other blur knives offer but with a difference. This onion blur offers a tactical styling to it, with a modified blade with partial serration. Its angled shape offers additional piercing power like no other. The onion blur provides additional piercing power using steel behind the knife point to penetrate through tougher materials. The knife’s special and different shape makes these tasks a lot more accessible to accomplish. The knife’s short edge makes opening boxes a lot simpler to do. 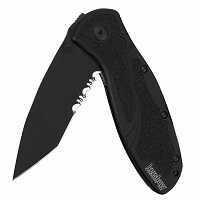 Kershaw has added a partial serration to the blade which makes it an excellent cutting tool for cutting webbing or rope and other materials. 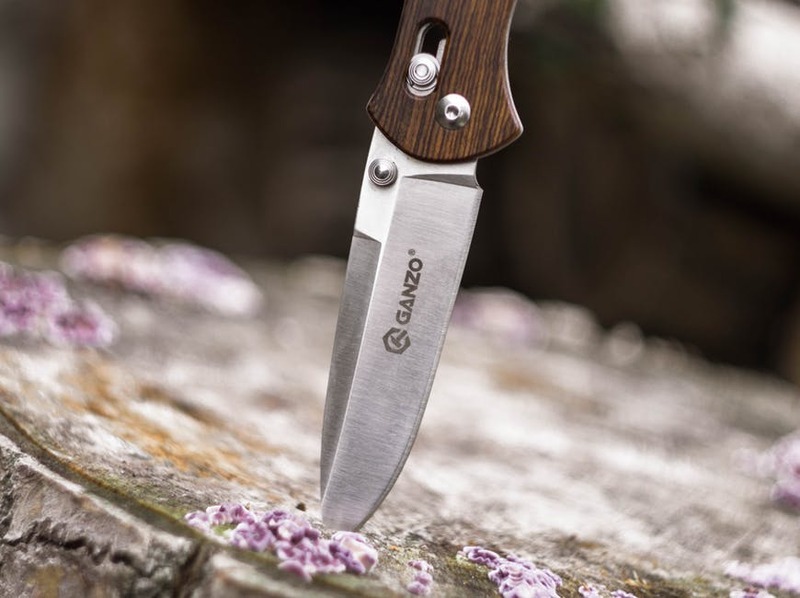 The knife’s hollow grinds ensure razor sharpness adding even more versatility.All of these extras make the onion blur a great choice for situations when you are going to need to make a substantial impact on your environment. Even in an emergency, the onion blur could be a lifesaver. The blade is made from ultra-quality high-performance Sandvik 12c28n stainless steel for extra rust protection and all round hardness. The blur’s DLC which stands for Diamond-Like Carbon coating helps to provide even extra corrosion resistance and is also nonreflective. The ken onion uses Aircraft aluminum which is more durable and uses a sure grip technology with Trac-Tec inserts for extra grip, and this also completes the Onion Blurs All round Look. This knife will be a great tool to own as well as a high-quality durable device that is light and portable for everyday use. The Kershaw Ken Onion Blur has so many reasons for its popularity. The knife has a reputation that boasts that it is the ideal EDC. It has a razor sharp 3-inch blade. The sleek is a great sized knife but also fits very nicely into the Every Day Carry category. It’s much slimmer design helps to make it a lot simpler to carry and is still a high-performance item. The Sandvik 14c28n System plainly means it can take care of business and can accomplish a full range of cutting daily tasks. The Ken onion blade is a modified drop point. Meaning it’s a great slicing tool. While the slimmer tip gives it the well-needed piercing capability and the ability to do more detailed work. The leek is partially serrated, so this makes it uses a lot more widely scraped. Much like another onion type of knives the leek features that desired speed safe ambidextrous assisted opening system that provides even more safety and quick draw operation. If you are left or right handed, this is no problem. The easy pull back system means all you have to do is pull back on the blade protrusion or push outwards on the knifes thumb stub and the leek is ready to accomplish the task at hand. As well as the 14c28n blade the leek is a stainless steel blade, keeping it clean and providing you with extra blade protection from corrosion. This also gives it a cleaner sleeker look. The super secure frame makes sure the user feels safer when operating the knife. Tip lock slider adds extra protection to keep the blade closed when not in use. We all know about the famous bear Grylls, his intuitive knowledge of survival and the outdoors. With the skills he developed from the British SAS, it is comforting to know that such a man has assisted in designing an EDC knife with the intention of survival. The scout drop point knife was crafted by professionals and people that have been in several survival situations, and have brought this ideal knife to us, the consumers. With their knowledge, we have been given the option to own an EDC knife that can act with us in real life situations that we may need to assist others or get ourselves out of. Whether you’re scaling Mount Everest or just doing your daily jobs, this Every Day Carry Knife is a must-have for any knife owner. With all of that in mind and 70 years plus experience of knife and survival gear expertise, you know that you are getting the best quality while purchasing this knife. Designed purely with scouting in mind, the scout draws inspiration from the experience of Grylls as Chief United kingdom Scout to 28 million scouts in the world. The scout’s design is thin and lightweight, making it a lot easier to carry. It is also a folding knife for even more portability. ½ serrated high carbon stainless steel drop point blade makes the scouting ideal for edge retention and cutting ropes. The scouts Dual-Sided Thumb Stud Makes single-handed operation a breeze. The scout’s ergonomic Textured Rubber Grip helps to maximize comfort and reduces slippage when operating the knife. It also features a lock back and clips for extra convenient carry. We also featured this EDC knife in our article, best boot knife. The Kershaw Cryo sports a classic Rock Hinderer design type. Build in pure steel with matt great titanium carob nitride coating on both the blade and the handle, maximizing durability and quality. They Cryo uses its safe speed technology to pen a lot quicker when you need to draw your knifes blade. This also provides assisted opening. You can access your knife with it built in flipper or its thumb stud giving you option when using the knife. The Cryo has a sturdy frame lock with a lock bar from for stabilization. And this ensures us that when using the knife that we have a solid lockup when the knife is not in use. This great but yet affordable EDC is destined to be a hinderer for most of us. 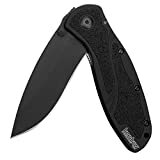 Kershaw has been developing knives since 1974, and the company has always been dedicated to quality. The Cryo is a solidly built knife design, but also a great weight for every day carrying purposes. A reversible carry clip is also included, making it even more portable and easier to carry. With multiple assisted opening and safety system, using this knife in your day to day tasks will be a breeze, ensuring that you can get your jobs done and make sure you are safe while doing so. Also knowing that you are buying a quality brand, with a ton of great features that a lot of other knives cannot provide, is a great relief. This knife is a definite must-have for the Every Day Carry Knife enthusiast. It’s better than the Buck 110FG. The Spyderco boasts tenacity, pure persistence, resilience and like in its name, Ambition. All of these are qualities that we try to aspire to when facing daily challenges. These particular traits are revered at Spyderco. They say this is why they named this range of folding knives after them. The ambitious black offers a wide array of features at an affordable five-star quality. The ambitious black knife features black scales, with a satin finished blade with a plain edge. This knife is aimed at a great value without sacrificing what you will need from a Spyderco knife. It has all the features you will need, and all the features you would find in a premium Spyderco knife. Features like the Walker Liner Lock; the liner lock is a specialized locking mechanism, purely designed for opening and closing folding knives. Then it uses skeletonized full-length liners for extra quality. Also, it uses a great quality set of phosphor bronze washers to ensure that your blade is drawing in smooth and it has a great fit and feel. The Spyderco is a great must for anyone who wishes to own one of purest forms of Every Day Carry Knives. This EDC is perfect in its uses, and will fit in any pocket, making it a great assistant for everyday us; but also not sacrificing the quality needed when performing various jobs. 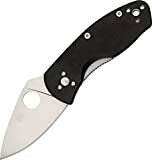 With the Spyderco Ambitious, you will want to carry in your pocket every day, and will always be happy that you have purchased a good quality knife, it is also featured on out list of the best combat knife. The last EDC we are going to take a look at is the Gerber Lite Pocket knife. Its small size makes it ultimate in portability. Although this knife is tiny, it sports a contractor grade, replaceable utility blade; which is quite literally, “Razor Sharp.” The Gerber Lite is a very dependable tool, which should be in your tool collection. This quality product, come featured with deep finger groves that help to provide you with a secure grip, along with comfortable usage. It either uses a contactor or standard sized grade utility razor blade that can be replaced with complete ease and even more added convenience. The Gerber Lite comes equipped with a great quality handle made of stainless steel, providing you with comfort and assurance that it will not corrode or get damaged. 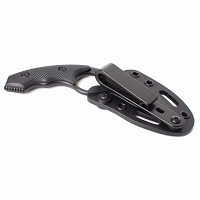 This handle can also double back as a money clip for extra portability. Cutting all and any different materials is quick and easy with the fine edge of the blade. Whether you are a novice outdoor enthusiast or a professional, this knife will be able to suit all of your needs. The Gerber Lite is a great companion for all and will be able to change the way you complete your daily tasks, whether they are difficult or even the simplest of things that you will do in your day. The Gerber Lite is durable and small, making it the ultimate must-have for any EDC owner, and will provide you with everything you need. 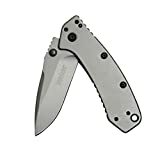 We loved it and would rank it among one of the best EDC knifes, similar to the Spyderco Endura 4. There are many factors one needs to consider while choosing the right EDC knife. We hope that our guide helps you in choosing the correct blade which is made for your requirements. Always make sure to get the best quality and also make sure that your EDC knife is very portable and offers you the correct safety. You are now one step closer to finding your EDC knife.